Few golfers are creatures of habit when it comes to selecting the right golf ball. Many will have their preferred choice but if they think a new ball will provide even the smallest advantage, they’ll try it. 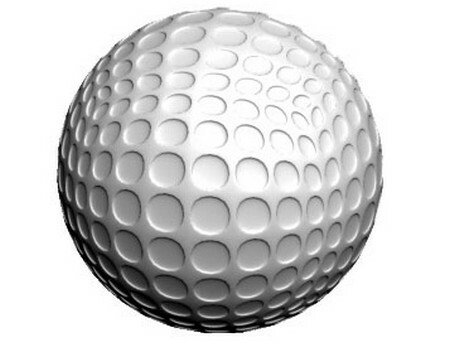 About one billion golf balls are produced each year in hundreds of different dimple patterns and materials, although the Rules of Golf appear to leave little room for such variety in their strict definition of balls. According to the Royal and Ancient, golf balls must measure at least 1.68 inches in diameter and weigh at least 1.62 ounces. They may not travel faster than 250 feet per second initially and not farther than 280 yards. This is a far cry from the production of the original ball, the feathery, stitched leather stuffed with a hat full of wet feathers, which hardened as it dried. Thought to be first made around 1400, the feathery was in use until the gutta-percha, a one-piece ball made from Malaysian tree sap, was developed towards the middle of the 19th century. The gutta-percha had a smooth surface and it was found that when the ball was cut and nicked it performed better. This led to the development of the hand-hammered gutta which was given a patterned surface and became the forerunner to the modern, dimpled ball. For more than a half-century, the only type of golf ball available was the three-piece with solid core, rubber windings and balata cover. 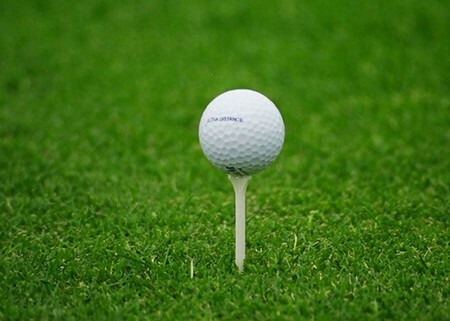 Basically, it was a ball which suited the best golfers but was used by everyone. Obviously, there was room for improvement and appeal to the mass market. The surlyn-covered ball was introduced and it proved a boon for the club golfer. It was durable, with its cover virtually cut-proof under normal playing conditions, and because of its hardness, provided lower spin rates, the result of which was a ball that flew farther and deviated less when hooked or sliced. The hard-covered balls, whether two-piece or three-piece, became the preference of just about every club golfer the world over. That began to change in the early 1980s with the development of long-distance balatas. Titleist’s 384 Tour Balata broke new ground. Titleist’s success lay not in the cover material but in aerodynamics due to the ball’s dimple patterns. The 384 (for the number of dimples), with customized pattern, was achieving about six yards more carry than other balata balls, although tour professionals claimed at the time they were hitting the ball 20 to 30 yards farther. In a twinkling there was a proliferation of extra-dimple golf balls with some having well in excess of 400 dimples. The number, it seemed, was not important as long as it was more than 384. It was a matter of more dimples, more distance. It is questionable if the proper research was done, if the “more is better” theory worked, if the dimples were the right width, the right depth, the right configuration. But each new ball on the market was proclaimed to travel farther, even if only a few yards, or feet. Golf balls have just about reached the limit of 250 feet per second initial velocity which is governed by the Rules of Golf. The makers already have the technology to manufacture balls that would have the average golfer hitting drives 300 yards and the touring professional around 400 yards, but sensibly this is illegal as it would make a nonsense of golf courses. Now, with improvements in distance being measured in such small increments, the interest by manufacturers is in playability. For many years, golf balls of different compressions have been available. Compression is the measure of how much the ball distorts at impact. When the clubface meets the ball, both ball and clubface are distorted. Since the ball is softer, it is flattened against the clubface. As it recovers its original shape, the energy of the distortion is transformed into speed. The lower the compression, the softer the ball and the more it distorts. As such a ball with low compression is designed to help the player who cannot generate much clubhead speed. Basically, ladies use an 80 compression ball, the average male golfer 90 compression and the power hitter 100 compression. The number on the ball that marks the compression is an approximation. A nominal compression, of say 80, refers to a real compression of 80 to 90, while a nominal compression of 100 would lie between 100 and 110. Compression again affects backspin. The difference between the 90 and the 100 compression version of the same ball model can range from 200 to 500 revolutions per minute. This ball is the favourite of the professionals, because it comes with a lot of natural backspin. Its solid core wound in rubber was originally covered with a substance between resin and rubber, which was harvested from various trees of the sapodilla family in South America. Although today, most manufacturers substitute the natural balata with synthetic, the playing performance of the ball remains. The balata will stop faster on the green and has a softer feel when putting. With the long game it can be worked more from left to right or right to left and it reacts better with finesse shots. The major disadvantages are loss of distance and lack of durability because the cover will be cut and scuffed with thinned shots when the leading edge of the clubhead hits the centre of the ball. A new mid-range ball has only just emerged onto the market. It is designed to provide more backspin than the conventional long-distance, surlyn-covered balls but less than balata models. There is little trade-off in distance and some manufacturers claim it is just as long as the hard-covered models. The development of the ball has been made possible through the application of new cover blends, whether it be a thinner surlyn, one such as lithium-surlyn or a new compound altogether. Spalding, for instance, has a unique material called zylin for its new Top-Flite Tour ball. It is designed to feel softer than surlyn, be more reactive at impact and produce more backspin. This was the first attempt by manufacturers to produce a mid-range ball with the wound centre giving the ball a softer feel while the surlyn cover offered durability and maintained a lower spin rate than balata. Designed for the majority of golfers, this ball offers two overriding advantages – greater distance and durability. Because it reacts less than any other ball, the two-piece surlyn varies less in flight and travels farther. In comparison to professionals, club golfers, more so mid to high handicappers, are less aware of their requirements and as such are more likely to experiment to the point where this becomes a never-ending process because there are so many new golf balls coming onto the market. In most cases this has little effect, for if a golfer stays within a certain category, say the two-piece surlyn-covered range, he or she will not notice much difference. However, if you want to switch to a ball with substantially different spin and flight characteristics you have to weigh up the aspects of your own play and your ability on the way to making the right choice. When choosing the golf ball you will play with, you should try to match your ability with the playing characteristics of the ball. The vast majority of golfers should not use the soft cover models because the disadvantages outweigh the advantages.